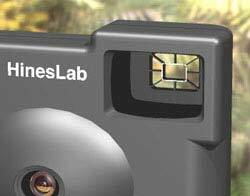 The Hines Lensless-Optical Camera Viewfinder projects a bright frame around the scene, especially useful for digital cameras with LCD screens that wash out in sunlight. The viewfinder uses ambient light to illuminate the projected frame, and works even better in bright sunlight. The viewfinder can be designed into any format camera, including a smartphone accessory handle. The Lensless-Optical Viewfinder uses reflective optics to project a frame around the scene. A rim of spherical mirror inside the front window reflects the bright rectangular frame (located on the back wall of the viewfinder) into the scene. Both elements are molded as part of the viewfinder so that no additional parts are required. The Lensless-Optical Viewfinder lacks the lenses that would be scratched or finger printed, or create an out-of-focus image in conventional cameras. The Lensless Viewfinder is ideally integrated into the bodies of cameras (above) to lower the manufacturing cost, or made as a detachable viewinder (below) for digital cameras with only LCD screens. 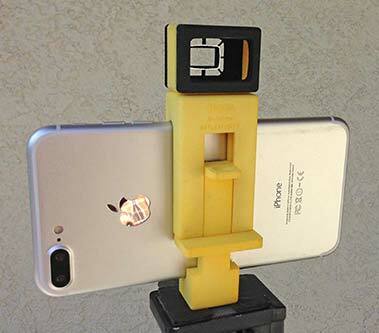 A pop-up version for small sports cameras. As a user approaches the camera, the the bright frame is reflected and focused by the front rim of mirror. The thin struts on the back wall are close to the eye and out of focus. The interior shows the open rim of the concave mirror on the camera’s front wall (right), facing the reticle on the back wall. Camera buyers frequently make judgments about the quality of a camera based on the viewfinder image. The Lensless Viewfinder provides the consumer a scratch-free optical viewfinder in an affordable camera at the size of any open-hole finder. The Lensless Viewfinder sets the camera apart from the competition, lowers the manufacturing cost, and supports a higher selling price, for increased profit. The Hines Lensless Viewfinder requires no (additional) parts, both optical elements being molded as part of the camera body. The focusing mirror around the front opening and reticle on the back wall are flashed with aluminum to make them bright. When the camera is assembled, the reticle faces the concave mirror and together form a reflective imaging system to focus the frame at the distance of the scene. The openings around the reticle provide eye relief for eyeglasses wearers. The Hines viewfinder provides all of the advantages of the Albada finder with near the zero cost of the open-hole finder. Scene light passes through the open holes, and also illuminates the reticle in the back window which is reflected to the rim of spherical mirror where it is projected into the scene. The view through a camera as the photographer moves around finding the center of the viewfinder. The image of the scene is unaltered, therefore is big, bright and in focus. Without the projected frame, the shifting fuzzy rectangle is all the photographer would have to frame the scene. • Projected frame line shows the area being photographed. • Bright unaltered view of the scene. • No motion parallax between projected frame and scene. • No lenses to degrade focus or strain eyes. • No lenses to cause internal reflections. • No lenses to cause color fringes. • No lenses to scratch or fingerprint. • No reduction of image size. • The “other” eye can remain open during framing. • No larger than any open-hole viewfinder. • Eye relief for eyeglass wearers. • Front window approximately 15% larger than lens viewfinders. Hines Lensless Optical Viewfinder: Light from the scene passes directly through the front opening of the finder to illuminate the retangular frame on the back wall. The photographer sees the focused frame reflected in the rim of concave mirror around the front window. On first using the Hines viewfinder, the reaction of most people when looking through the open hole is surprise, to find a bright frame line around the scene. It seems like magic. The Hines lensless viewfinder excels in bright sunlight, where the LCD screen of a digital camera or smartphone would be washed out and unusable. *Note to optical engineers: Compare the 100% MTF of a scene viewed through any open-hole viewfinder, to the degraded image of any other viewfinder using lenses, beam splitters, a ground glass or an LCD. The reflective optical design of the Hines Lensless Viewfinder adds the bright frame line without degrading the image of the scene. “What a marvelus idea.” Lisa Davidson, lithographic printer, July 23, 2017. “Innovative… Easy to use: giving the same effect as a collimated optical system. 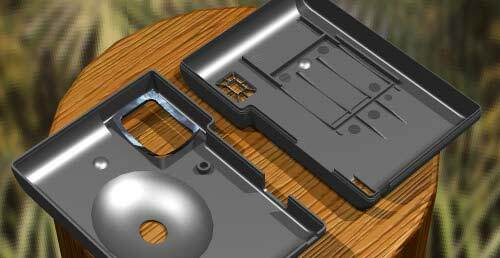 The idea seems very clever, low cost, easy to manufacture, it could eventually be a product by itself… as an engineer I like brilliant ideas“. Alphonse Menudier: France, April 2013. “The principle is so brilliant in its simplicity.” Antony Brown: Photographer, London, England, Sept. 2009. “I just happened across this…. very slick! ; best of luck w/commercializing it.“, Rick Oleson, Industrial Designer, Kentucky, USA, Oct. 2003. “Not only does it aid the photographer by accurately delineating his field of view, but will be useful to any camera manufacturer who is trying to reduce the cost.” Paul Ruben: Optical engineer, former head of Eastman Kodak’s lens design dept., Rochester, New York, Dec. 2000. “Extremely impressive. If I were working for a camera company, I would be very, very interested. Everyone should be. After seeing the models, I certainly prefer it over any Albada system.” Bill Ewald, Kodak Sr. Optical Engineer, formerly taught at the Institute of Optics, University of Rochester (New York), Sept. 2000. “… elegantly simple“, “a parallax free viewfinder that is impossible to degrade with finger print smudges“, “I tested it with glasses and it worked fine. Plenty of eye relief“, “… important and novel“… “It has the potential to become a new standard.” “I tested it with clear safety glasses and it worked fine. Plenty of eye relief.” Fred Bushroe: Optical engineer, Tucson, Arizona, April 2, 1999. “I wish I’d thought of it.” Kodak Apparatus Division engineer. This was just one comment in a presentation of the viewfinder in one of several licensing meetings at Kodak. Rochester, New York, Dec. 6, 1997. A sample of open-hole viewfinders found in many single-use cameras, and provide a poor reference for framing. The scene is viewed unaltered through the open hole. The front opening is very close to the eye and out of focus, and shifts relative to the scene as the eye moves. • No lenses to degrade focus. • No lenses to cause reflections. • No lens edges to cause flare. • Out-of-focus front edges do not accurately define the area covered by the taking lens. • Motion parallax of the frame relative to the scene. The Reverse-Galilean finder is found in 99% of single-use cameras and many reloadable cameras, and in concept is Galileo’s 1609 telescope used in reverse. Only a single negative and positive lens are required to form the viewfinder, as seen in this one-piece molding from a Kodak camera. Notice that the image is smaller. The edges of the front window are close to the eye and severely out of focus, eliminating any accurate reference for framing. As the eye moves behind the viewfinder, the apparent aim of the camera shifts due to motion parallax. This image is shown out of focus which is avoidable; however, is more often the case than not. • Approximately 15% more compact than open-hole finder. • Smaller image, making it hard to see. • Out-of-focus front edges do not accurately show the aim of the camera. • Motion parallax between the finder’s front window and the distant scene as the eye shifts. • Image distance often focused too close for comfort. Users must squint to bring scene into focus. • Focus of image can vary from center to corner. • Internal reflections between uncoated lenses. • Simple 2-element design creates color fringes. • Flare from edges of the lenses. • Lenses can become scratched or finger printed. Consumers have been given only this choice for so long that they have become inured to the problems of reverse-Galilean finders. The Albada viewfinder is an upgrade of a reverse-Galilean finder, and is found in mid-priced consumer cameras, however is too expensive for single-use cameras. A thin aluminized frame is deposited on the interior surface of the positive lens at the eye. The concave side of the front lens is partially aluminized to act as a magnifying mirror. Scene light passes through the two lenses which minifiy the image (typically to 33-85%). Scene light also illuminates the reticle on the eye lens and is reflected (shown in red) to the concave reflective portion of the front lens, and then reflected to the eye as being in the scene. The image is minified by the lenses. The position of the soft-focused front edge of the finder shifts with eye movement; however, the bright frame shows the part of the scene being photographed. Internal reflections between lenses can be distracting. The image distance in many Albada (and Galilean) viewfinders is focused uncomfortably close. 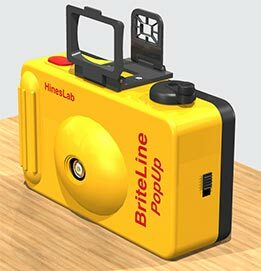 • Projects a bright frame into the scene to indicate the field taken by the camera lens. • No motion parallax of the projected frame relative to the scene if the eye moves behind the finder. • Front window is approximately 15% smaller than open-hole finders. • Cost of lenses and assembly. • Focus of scene can vary from center to corner. • Image is dim due to front-mirror coating. • Reflections and flare from uncoated lenses. 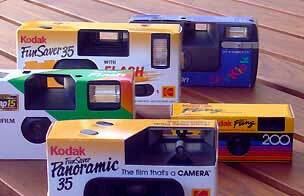 • Too expensive for single-use cameras. Hines’ original lab notebook entry for this invention. Consumers have not expected to find bright-frame viewfinders in single-use cameras, having seen only simple reverse-Galilean finders. The patented Lensless Optical Viewfinder provides the projected frame at near zero cost. The Hines Lensless finder provides a novel and truly useful feature, perfect for price-sensitive single-use cameras. • Photo Imaging News, June 14, 2004, Vol. 21, No. 13, p. 6. • Photo Marketing Association News, Oct. 2001, Vol. 77, No. 10.